Photographing the Lake District is a comprehensive photographic-location guidebook to the most beautiful places to take photographs in the English Lake District. The book guides the reader to beautiful places and gives advice on how to take the best photographs when there.In the book's first section, author Stuart Holmes describes 70 locations and hundreds of viewpoints for the reader to visit. Each location chapter starts with an overview describing historical, literary, geological, and natural history features including the photographic potential. Detailed directions with maps and sat nav information are given, along with access information including whether a location is accessible by wheelchair.The locations include: Lakes, Fells, Valleys, Waterfalls, Cottages and Farmhouses , Woodlands, Rivers, Bridges, Boats, Jetties, Wildlife, Classic Views, Landscapes and Panoramas, Villages, Shows and Events, Historic Houses, Castles and Gardens.The second section consists of chapters offering photographic advice on how to improve your photography including: camera and lens choice, composition, exposure, depth of field, sunrise and sunset photography, how to catch a rainbow and how to photograph waterfalls.It is lavishly illustrated with over 360 high quality colour photographs of Lake District landscapes and rural life. 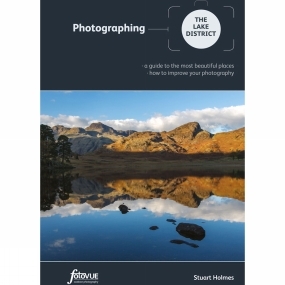 This guidebook will appeal to both keen photographers and anybody with a camera who visits the UK's most popular National Park.Author and professional photographer Stuart Holmes has lived in the Lake District all his life and has been taking photographs for over 30 years. His work has been published in books and magazines and he has exhibited around the world.